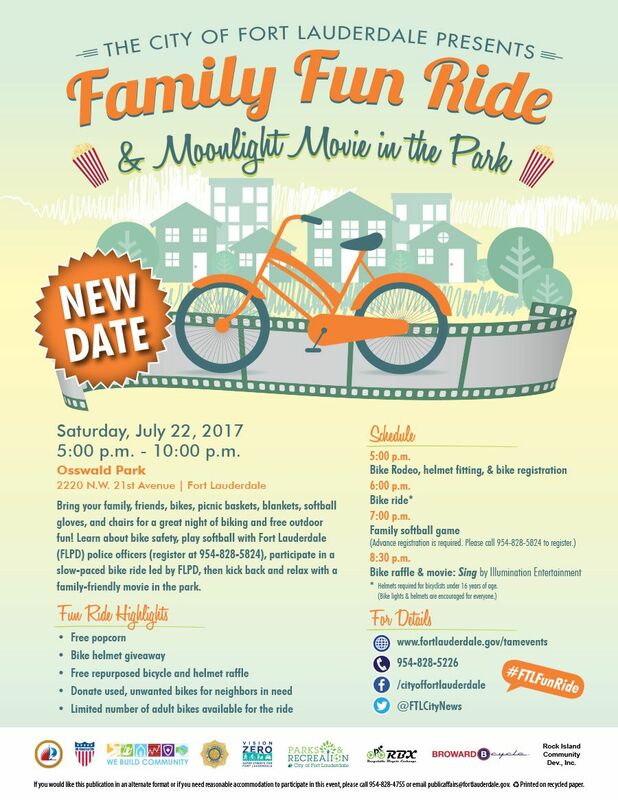 The City of Fort Lauderdale is partnering with the Rock Island Community Development for the next Family Fun Ride & Moonlight Movie in the Park. Bring your family, friends, bikes, softball gloves, picnic baskets, chairs, and blankets for a great night of free healthy activity and outdoor fun! Learn about bike safety, participate in a slow-paced bike ride, and watch a movie in the park. Family softball game with Fort Lauderdale Police Officers. Sing movie in the park following the softball game. Donate used, unwanted bicycles. RBX volunteers will fix up the bikes and donate them to those in need. Limited number of adult bikes available for the bike ride. Bike Raffle & movie: Sing by Illumination Entertainment.